MainAll NewsInside IsraelNaftali Bennett as Defense Minister? Naftali Bennett as Defense Minister? 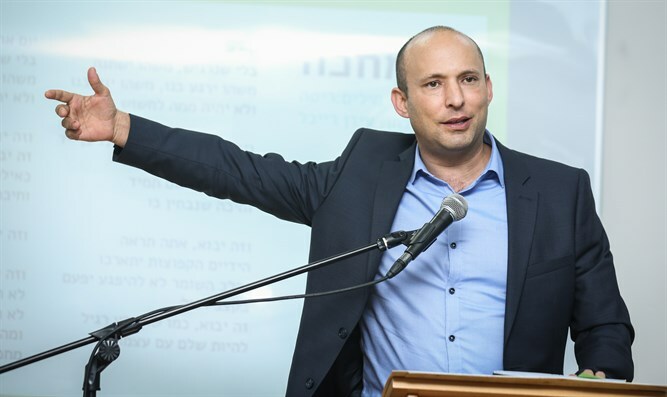 The New Right will press the next government to tap Naftali Bennett as Defense Minister, and demand that it retain the Justice Ministry portfolio, Bennett said Wednesday. Speaking with Yediot Ahronot Wednesday morning, Education Minister and New Right chief Naftali Bennett said that either he or former IDF chief of staff Benny Gantz would likely take the Defense Ministry next term – an appointment that would likely determine whether the government will adhere to right-wing principles. Last year, Bennett demanded Prime Minister Binyamin Netanyahu appoint him as Defense Minister to replace Avigdor Liberman, who bolted from the government in November. Despite an ultimatum by Bennett, Netanyahu refused, with the Jewish Home chief ultimately backing down on his threat to topple the government. After the government subsequently moved for early elections, however, Bennett and Justice Minister Ayelet Shaked left the Jewish Home party, and established the New Right (HaYamin HeHadash). Now, at the helm of the new party, Bennett says he still hopes to secure the Defense Ministry, but expressed concern former IDF chief Benny Gantz, a newcomer to politics, could take the Defense portfolio. With polls showing Gantz netting 11 to 14 mandates in the April 9th election, Bennett said the New Right hopes to secure 15 seats to ensure they take the Defense Ministry portfolio.